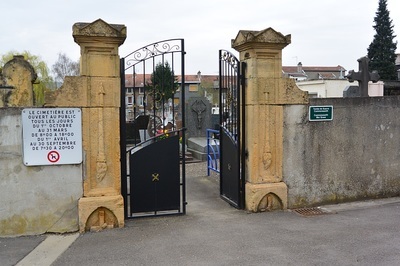 The commuanl cemetery is on a small road off the Rue Eugene Bastien which can be accessed from the Rue de l'Hotel de Ville, a road off the main D137. The communal cemetery contains one airman of the first world war, he was killed on the last day of the war. Captain Duncan Ronald Gordon Mackay, D. F. C. Mentioned in Despatches, 55th Squadron, Royal Air Force, died 11th November 1918, aged 23. 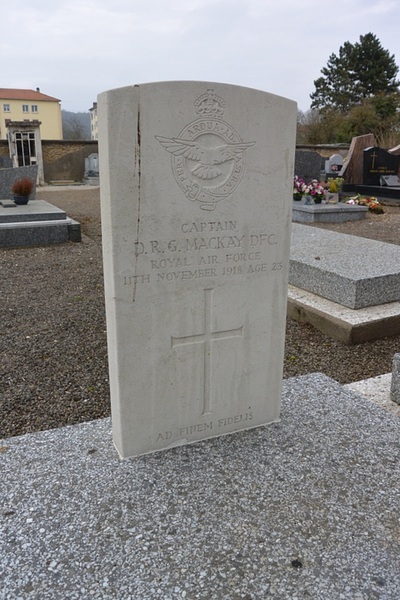 Son of D. L. M. Mackay, I.C.S. and Mrs. M. G. C. Mackay, of Gate House, Midhurst, Sussex. Born at Inverness. Enlisted 1914, 19th Bn. Royal Fusiliers. Commissioned Argyll and Sutherland Highlanders. Educated at Cheltenham College, 1909-1914. Military Plot.